Every year in the United States, 8 million dogs and cats enter shelters and more than half won’t make it out alive. An unspayed female cat, her mate and all of their offspring, producing 2 litters per years, with 2.8 surviving kittens per year can total 11,606,077 cats in 9 years. Source: Spay USA. An estimated 6 to 8 million dogs and cats are euthanized in shelters each year. Millions more are abandoned, only to suffer from illness or injury before dying. Source: Doris Day Animal League. Thankfully we have people who have become aware of this animal crisis and have taken action. Pilots N Paws is a non-profit national organization of volunteer pilots that work together and connect shelters, rescues and families with at-risk animals. This organization was founded in February of 2008. The volunteer pilots that take part in Pilots N Paws have a passion for flying and a passion for animals. There are about 5,000 volunteers across the United States, without which thousands of animals would continue to face hardship and death. Pilots N Paws, with the help of their pilots, is making a statement about animals that need help and assistant. The transport of these animals is made in a very safe and human method. Each pilot is assigned dogs based on the size and types of crates that each aircraft can carry. Double M Aviation is proud to provide maintenance to two such volunteers! 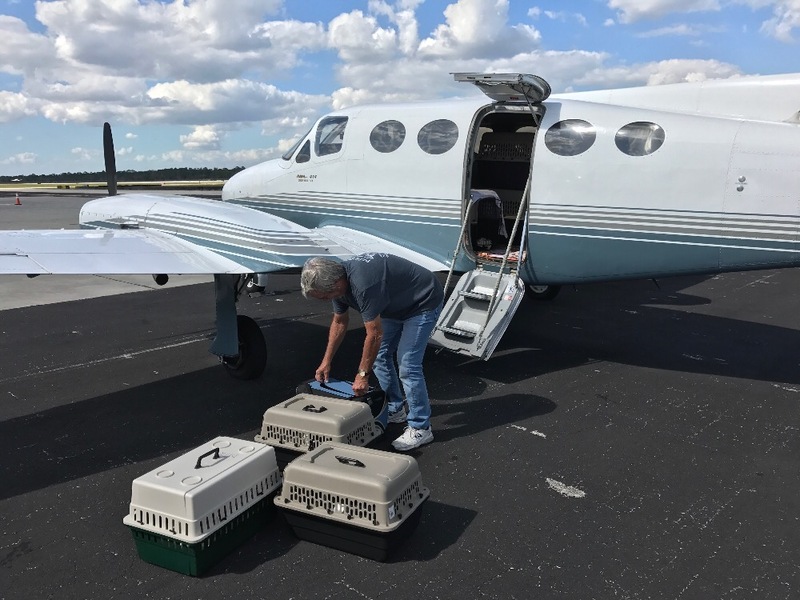 Tom Dillion and Jeff Hibbard each selflessly donate their time, airplanes, and associated expenses to aid in re-homing many abandoned and at risk dogs. Tom Dillon participates in the Pilots N Paws program as well as completing trips independently using his Cessna 414. With a fuel capacity of 206 usable gallons and a huge cabin-class interior, the Cessna 414 allows for the transport of multiple crates at a time. However, along with the large amount of cabin space this twin engine Cessna brings to the table, comes a large fuel bill. To help offset the cost Dillion incurs while utilizing his Cessna 414 to rescue homeless dogs he has set up a Go Fund Me account with all proceeds going directly toward the fuel bill. You can find his page here. Jeff Hibbard flies a Piper PA28R-200 Arrow. While the Arrow’s cabin may not be as spacious as the Cessna 414, she is a work horse of her own class. With a typical empty weight of around 1500 lbs and a range of approx. 600 nm, the Arrow can be loaded up with fuel and a pilot and still carry multiple crates. Hibbard has his aircraft set up so that the co-pilot seat and rear seats can be removed to facilitate moving the crates in and out with ease.